When a church calls a pastor, the expectations that are made upon that person can sometimes be unrealistic. In a few instances, the expectations of a pastor can border on abuse. When counseling pastors who are considering a call to a church, I often times tell the pastor to take a long look at the job description. After looking at that, I tell the pastor to ask about any expectations that are not listed in the job description. Sometimes the assumed expectations that a congregation has about what a pastor will or will not do are even more important than the job description itself. In my years of ministry I have heard nightmare stories from pastors and churches about misunderstood expectations that have led to incredible pain on the part of the pastor or congregation. So, what are some of the promises that every pastor should make to the Lord, their family, and to the church that they serve? Here are some things that I think the Lord, my family, and my congregation should expect from me. These are areas that every pastor struggles with. Every pastor will fail on these from time to time. We are, after all, human. 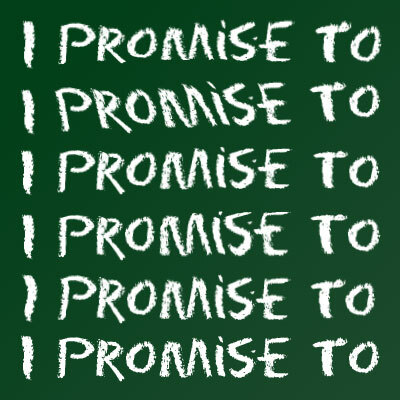 But, that should not stop us from striving to do our best to keep these promises. These promises should motivate us to get back up and try again whenever we fail. I promise to make Jesus Christ the greatest Love of my life. I will pursue a growing relationship with the Father, the Son and the Holy Spirit. I will make God my top priority. I will seek the approval of the Lord over the approval any human being. I will strive to live my life in such a way that those around me will see Christ reflected in me; following in the servant way of Jesus. I will seek to make much of Jesus and little of me. I will strive to do the work of ministry through the power of the Holy Spirit, knowing that anything I accomplish of eternal significance will be because of His power at work within me. I will make my prayer life a priority, seeking God’s face continually throughout each day. I will seek to understand God’s preferred future for my life, my family and the church that He has called me to serve. Then, I will follow His path no matter the cost. I will recognize my spiritual poverty and need of God’s grace, and forgive as God has forgiven me. I will confess my sin, daily, to the Lord; and seek to join Him, daily, in His mission of making more disciples. . I promise to love my family more than the church that I serve, the work that I do, and the personal dreams that I have. I will seek to be the shepherd of my family more than being the shepherd of the church God has called me to serve. My spouse will be my greatest love after the Lord. My spouse should know that she is more important to me than the church that I serve. I will model to my family that loving God and loving the church isn’t the same thing. I am called to love God first, my family second, and then others. To my children, I will strive to love your Mom as Christ loved the Church; laying down my life and my dreams, for our life and our dreams. I will love you for all of my life. I will recognize that you are the greatest gift that God has ever given me, next to Himself and your Mom. I will not let the busyness of ministry crowd out the life that God has planned for our family. You are my greatest priority – after God and after your Mom. I will disciple you at home, and be a volunteer in some of the ministries that you are a part of. I will do my best to not embarrass you, and will ask your permission before using you as an illustration in a sermon I preach or a lesson that I teach. I will take an interest in the things that you are interested in; because if it is important to you, it is important to me too. I will not expect of you the perfection that belongs to God and God alone. I will love you when you make mistakes and not allow the unrealistic expectations of those in our church to be expectations that I place upon you. I will pray for your future spouse and when the time comes to let go, I will give you back to God, recognizing that you were never really mine to begin with. I promise to remember that the church that I pastor is God’s church. It doesn’t belong to me. I will seek His direction, in tandem with the leaders that God has placed around me, for this church body. I promise to love you, with the hopes that the community around us will know that we are Christians because we love one another. I promise to work hard. I will study God’s Word and do my best to accurately teach what Scripture teaches. I won’t be perfect. When I make a mistake, and realize it, I will own up to it and do my best to correct the problem. I will be an advocate for the pastoral and support staff that you have entrusted me with. I will pursue integrity in all areas of my life, seeking to be someone that you can trust, surrounding myself with people who will hold me accountable to God’s standards. I will do my best to not embarrass you, or the cause of Christ, by bringing shame upon His name. I will do my best to treat each attender of our church with honor, respect, fairness and confidentiality. I will speak the truth in love, even when it may not be what you want to hear, and I will welcome the same from you. I will welcome all, but not affirm the sin in any – including myself. I will recognize that there will be some people at our church who will be difficult for me to love, and try to remember that I am many people’s person who is difficult to love. I will recognize that I am not the Savior, and therefore won’t have the solution to every struggle that our church has. God does. I am not ultimate authority. God is. I am not going to be competent in every area that our church will face; so I will work together with the beautiful body that Christ has built here to accomplish His purposes. I will recognize that the church that I serve does not have the “corner on the market” on God. I will live a life of inter-dependency with other pastors and church leaders across denominational lines. We will pray as a body. We will serve as a body. We will learn as a body. We will worship as a body. I will seek to make sure that the vision that we pursue as a body comes from Christ speaking to the church and not just to me. I will do my best to help you discover your gifts so that you can honor God in the unique way that He has made you. I will recognize you as a gift to the body of Christ. That said, I will not reward dysfunction or those whose motives prove to be detrimental to the overall body. I will hang out with people who don’t know Jesus so that you can see modeled in me someone who is actively living out the Great Commission and the Great Commandment. Okay, I’d love to hear your thoughts on these. For further ideas, check out the National Association of Evangelical’s recent Code of Ethics for Pastors.